My first Grandmother's Flower Garden Block is completed. This is for Wendi, who requested either an orange or yellow center. I tried to use the teflon (I think that is the material) templates but my points just didn't get sharp enough so I went back to using the sew line pen. I learned about the glue pen method from Sheryl, over in Australia when I made her a Spiked Wheel block and it works for me better. 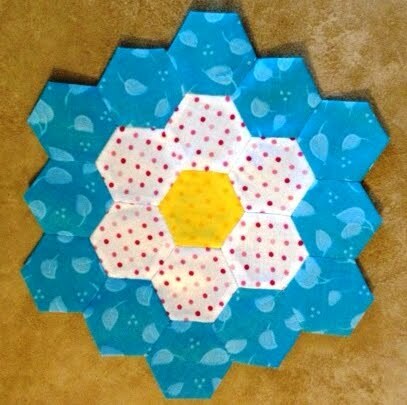 I rather enjoy the paper templates and will use them on any future hexagon work!